This release is dedicated to our IRC bot named “EV0001”, thanks for serving us with log files and pizza in the last years. An embedded font (called Shinonome) that looks like MS Gothic. No external font file needed anymore! Rendering issues with some BMP and PNG files were fixed. Huge improvements in the internal memory management of the Player, crashes because of deletion of still referenced game objects shouldn’t happen anymore. Multi-language RTP support. 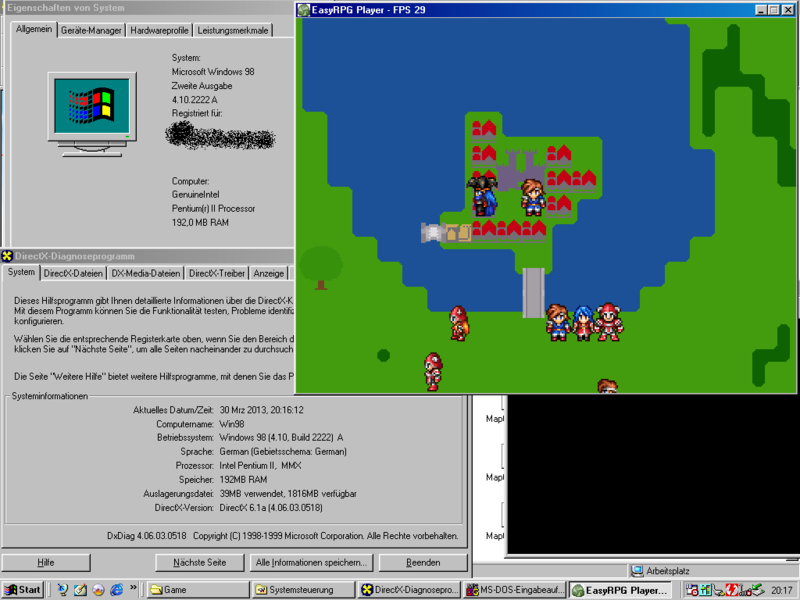 Play Japanese games that use files from the RTP with the English RTP (and vice-versa). The Player handles all the magic in the background for you. You can download the Player in the download section of our new website. For 0.1 we only provide binaries for the common systems Windows, Linux and MacOS X. We don’t have enough developers to maintain lots of ports and they were slowing down our development process. But don’t worry, our Player is still perfectly portable to other systems. Ports for other systems will be readded in our ongoing development process. At the moment improving the compatibility and the user experience of the Player is our highest priority. The next release (v0.2, codename “Alex”) will probably be released this year and on our roadmap is the long awaited battle system and and a better save system and of course improvements in the user experience. And we plan to make new stable releases more often so that you don’t have to wait two years again :). At last we recommend that you check out our new user section in the wiki containing many useful information about features of the Player!